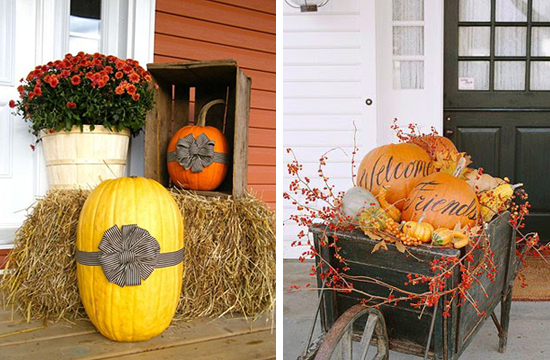 Get inspired to decorate your front door or porch with these charming ideas. Adapt these ideas to suit your taste and the style of your home. 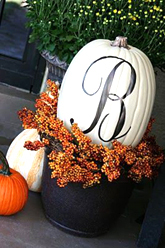 Choose a white pumpkin and add your family initial. The pumpkin is sitting in a simple black plastic flower pot. Even if you aren't good at painting, this can be done with a stencil. 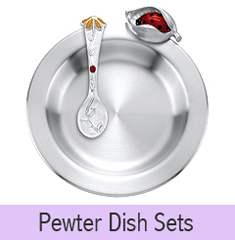 Add fall color to the pot with leaves, berry picks, dried grasses, or anything that you like. Tired of a ho-hum front door wreath? 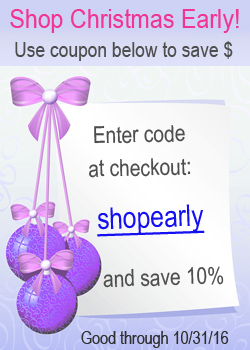 Try one of these great ideas. 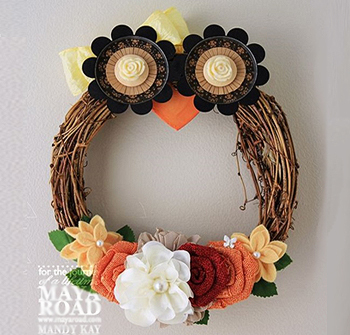 Put together an "owl" grapevine wreath -this is adorable! Do you have a fallen tree branch? 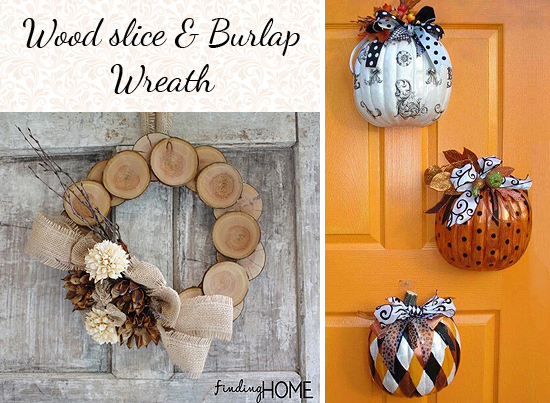 Cut it into slices and make this beautiful wood slice and burlap wreath. It is simple but so elegant. 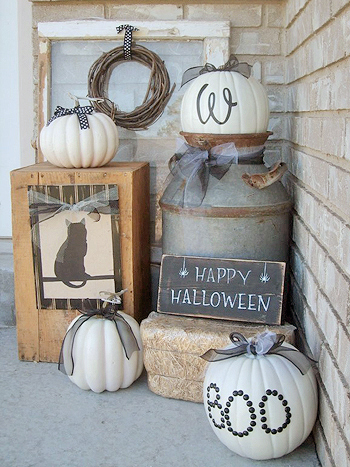 Or use half pumpkins and decorate them to match your theme. If you need a tall element try making one of these topiaries. 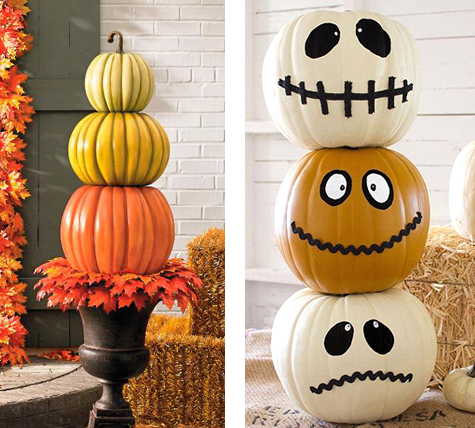 Go with an elegant look or the absolutely delightful stacked pumpkins on the right. 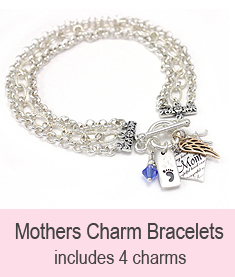 Use items that you have on hand to create a "setting" like the one shown below. If you like to keep things simple or don't have a lot of room at your front door try one of these ideas. Do you have a porch? 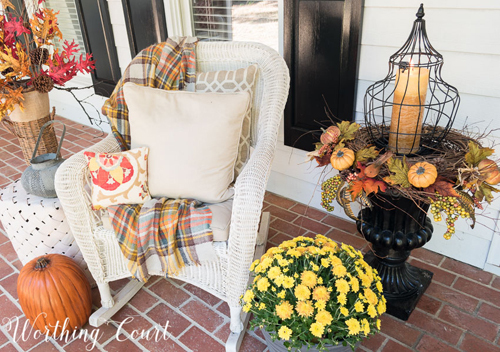 If your front entry includes outdoor furniture try adding a few festive items to the decor. Seasonally colored pillow or blankets will give them a boost. Buy a cheap door mat and paint with with leaves or other decorations to make your porch inviting. For a home with high contrast colors, this neutral toned decor style is very elegant. 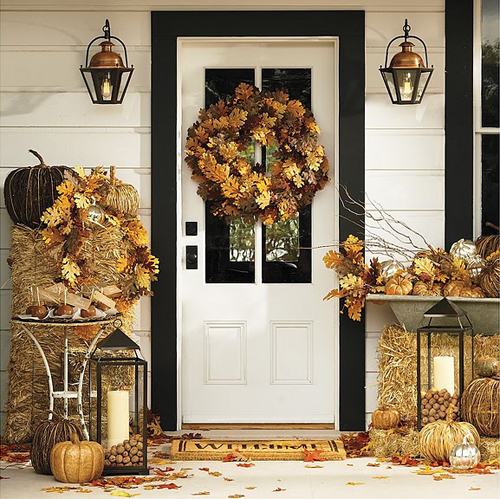 Have you decorated your front entry for fall yet? If not, use the above ideas to inspire you to create a special look that is warm and welcoming.